Red's Shoe Diaries: Brave New Year! 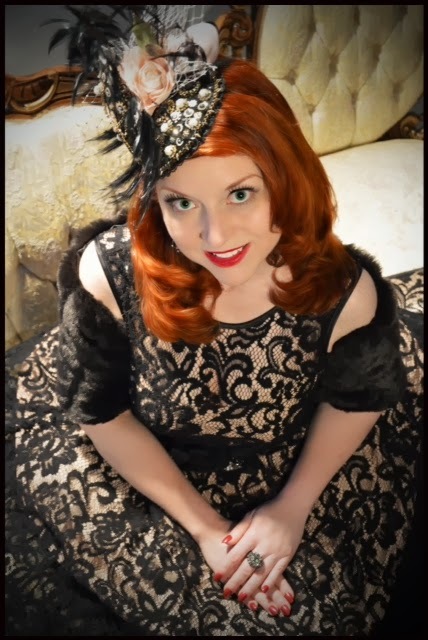 I found this hat on a field trip to Chicago last Spring with the Indianapolis Museum of Art's Fashion Arts Society, where we visited the studio of couture milliner Loreta Corsetti. It's not your everyday kind of hat, and I couldn't wait to wear it on New Year's Eve for a gala celebration at the museum. I knew I was going to wear the hat to ring in the new year and originally thought I'd title this post as "Hatty New Year." But, I changed my mind after a woman approached our table during a pre-gala dinner at Seasons 52 to tell me how much she admired my New Year's Eve attire, and remarked that I was "so brave" to wear a hat and that she hoped she had the courage to do something similarly fabulous next year. I've mentioned it before, but I generally prefer to shop alone, and most of the examples of "buyer's remorse" in my closet are the result of too much emphasis placed on the opinions of shopping companions or overzealous sales clerks when I was otherwise "on the fence" about a particular garment. As I've gotten older, I find that my wardrobe is more and more driven by what makes me feel my personal best, even when the choices are unconventional. I suppose that having the courage to be myself could be considered brave, and that is my wish for all of you in 2014. Have the courage to be unapologetically yourself - it's a brave new year! Jody, I'm proud of you! The fact that people don't wear hats at all just means we have to be prepared for the extra attention they bring. Only a confident woman can wear a hat now days because of that. Thanks for the inspiration. I plopped one on today at your encouragement. You're a vision and a delight to the eye! Thanks so much, Crystal! It's a perfect day for a WARM hat here in our winter wonderland. Would love to see what you chose, and I'm glad to have encouraged you. My hat's off to you in 2014! Wow you are so incredibly pretty. Perfect stunning look, beautiful. Wishing you a happy new year. Thank you so much, Imogen! I can tell from your blog that we share a love for vintage inspired looks. So nice to hear from someone in Sydney - it's my favorite city on Earth. I lived there for 3 months and it wasn't long enough! Happy new year! Glamorous! I'm very impressed with every piece that makes up this perfect New Year's Eve ensemble. Your hat is divine. Cocktail hats are my favorite and you wear this piece of art with self confidence and panache. Thank you for sharing with Hat Attack. Thank you so much. I really appreciate it Hat Attack is an inspired idea - love seeing how others incorporate exceptional toppers into everyday life. I'm so happy that Crystal from Dressed Her Days Vintage told me to check out your blog. Happy New Year!